Double Registered posthumously with The Thoroughbred Jockey Club in Volume VI of their American Stud Book. From our Arieana Notebook: A desert-bred stallion and the original horse on one of our failing CMK sire lines, *Kismet, compiled an impressive record of Arabian racing achievements in his lifetime. Bred by the Montefiq Shammar and foaled in the desert in 1877, *Kismet was purchased in Arabia as a five-year old and then taken to Bombay in 1882 by his new owner Abdur Rhaman, a famous and highly regarded Indian horse dealer who, in turn, sold him there to Lieutenant R.S. Broadwood of the British 12th Royal Lancers. 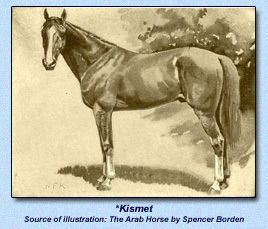 Horseracing was an extremely popular sport during the British colonization period in India, and *Kismet was rated one of the best Arabian race horses during those times. In 1883-'84 he swept almost everything before him; his total winnings for those two seasons in India amounted to £30,000 (equivalent then to $150,000) ~ an enormous amount of money in those days. Bangalore, July 12, 1883, the Mysore Cup, 1 1/4 miles, carrying 139 lbs. Bangalore, July 14, 1883, the Mysore Purse, 1 1/2 miles, carrying 134 lbs. Bangalore, July 19, 1883, Aga Kahn's Purse, 1 1/2 miles, carrying 134 lbs. Poonah, September 8, 1883, Aga Kahn's Plate, 1 1/4 miles, carrying 126 lbs. Poonah, September 11, 1883, Aga Kahn's Purse, 1 3/4 miles, carrying 131 lbs. Hyderabad, Nov. 22, 1883, Deccan Handicap, 1 1/2 miles, carrying 119 lbs. Bombay, February 12, 1884, The Derby, 1 1/2 miles, carrying 136 lbs. Bombay, February 14, 1884, Aga Kahn's Purse, 1 1/2 miles, carrying 133 lbs. Immediately after this last race Lieutenant Broadwood shipped *Kismet to England. 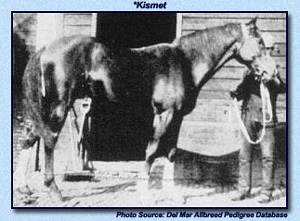 After a very long and extremely rough sea voyage, *Kismet landed in the latter part of April 1884, and so confident was his owner of this horse's prowess, that he matched him to run at Newmarket in July against the famous Asil, without proper conditioning and training. The younger Asil beat him in this race for one of only two times he managed do so in *Kismet's entire racing career. After that July race, *Kismet was sold to Colonel R.D. Cunyngham V.C. (Victoria Cross), and racing under the colors of his new owner, *Kismet twice afterwards turned the tables on Asil. In 1885 *Kismet was ridden at Newmarket by Fred Archer, who rode the Derby winner five different times, and he pronounced *Kismet the gamest horse he ever rode and that he had the most spring of any horse he had ever ridden. Such also was the opinion of Charles Wood, who rode him that following year in his races against Asil at Newmarket and Sandown Park; both these races were for two miles, and *Kismet won "hands down," carrying 126 pounds. After that he was bought by Honorable John Corbett, Member of the Parliament, who used him as a saddle horse, and Corbett in turn sold him to the Reverend Francis Furse Vidal in the Spring of 1890. Now at thirteen years old, *Kismet had his first opportunity to sire purebred Arabians, but Vidal used him sparingly at stud: his only four purebred registered foals in Great Britain were *Nimr (out of *Nazli) and Havilah (out of Hagar) in 1891, and *Garaveen (out of Kushdil) and Kantaka II (out of Sultana) in 1892. In the Autumn of 1891, Vidal entered into a lease agreement with Mr. Randolph Huntington, of Oyster Bay, Long Island, New York, at a price of £200 per annum plus insurance and transportation costs and with the agreement that *Kismet be limited to breeding 20 mares a year and that he not be sold while in the United States. After a long and stormy passage *Kismet reached New York on the steamship SS Canada on November 11, 1891, only to die two hours after landing, of pleuro-pneumonia contracted on the voyage. Today at Arieana Arabians we value the *Kismet influence for his heart, speed, and stamina as we joyously find his name weaving in and out throughout the mid-pedigrees of our CMK horses linebred on the incomparable stallion Rahas (Gulastra x Raad). Blunt, Lady Anne. Journals and Correspondence 1878-1917. Edited by Rosemary Archer and James Fleming. Alexander Hariot & Co. Ltd. Cheltenham, Glouscestershire, England. 1986. pp 413-416. Mulder, Carol June Woodbridge. Imported Foundation Stock of North American Arabian Horses. Volume 2 (Revised Edition). Borden Publishing Company, Los Angeles, California. 1993. pp. 218-223. For more information on *Kismet or to see for yourself how his influence lives on in the prized and cherished horses of Arieana Arabians, please contact us. Visitors are always welcome; appointments are appreciated. Copyright © 2003-2012. Website designed and maintained by Suzi Morris. All rights reserved. This page created for Arieana's Heritage Notebook on April 30, 2004. Updated with new information June 29, 2012. Current as of September 4, 2012.